Lymphedema is caused by damage to the lymphatic system due to cancer treatment and is a common side effect for breast and head & neck cancers. Due to the generally considered incurable nature of lymphedema, the authors of this paper argue for multi-disciplinary strategies to reduce onset, progression and complications of lymphedema. The Abstract (de Valois et al., 2012, p. 301). Purpose: Within a three-step mixed-methods study to investigate using acupuncture and moxibustion (acu/moxa) in the management of cancer treatment-related upper body lymphoedema, Step 2 obtained preliminary data about: 1) whether acu/moxa can improve quality of life, 2) the most troublesome symptoms, and 3) adverse effects. Methods and sample: An exploratory single-arm observational clinical study included breast (BC) and head and neck cancer (HNC) survivors with mild-to-moderate uncomplicated lymphoedema for ≥3 months, ≥3 months post active-cancer treatment, no active cancer disease, undergoing routine lymphoedema maintenance. Participants received seven individualised treatments (S1), and six optional additional treatments (S2). MYMOP, SF-36 and PANAS were administered at baseline, during each series, and at follow-up 4 and 12 weeks after end-of-treatment. The primary outcome was change in MYMOP scores at the end of each series. Key results: Of 35 participants recruited, 30 completed S1 and S2, 3 completed S1, 2 were lost to the study. Mean MYMOP profile change scores for BC participants were 1.28 points improvement on a 7-point scale (sd = 0.93, p < 0.0001, n = 25) for S1; and 1.41 for S2 (sd = 0.94, p < 0.0001, n = 24). S1 HNC change scores were 2.29 points improvement (sd = 0.62, p < 0.0001, n = 7); and 0.94 for S2 (sd = 0.95, p = 0.06, n = 6). Changes in some SF-36 scores for BC participants were significant to 4 weeks after treatment. No serious adverse effects were reported. Conclusion: This small study suggests acu/moxa is an acceptable adjunct to usual care for cancer survivors with lymphoedema. Further rigorous research is warranted to explore the effectiveness of acu/moxa in reducing the symptom burden. Cancer patients at risk of developing lymphedema want to learn how to recognize early signs and symptoms, and once diagnosed, treatment aims to reduce size, physical dysfunction and complications (de Valois et al., 2012). de Valois et al. (2012) cites research showing that lymphedema has negative psychosocial effects for women and is “One of the most troublesome and feared consequences of breast cancer surgery” (Ganz 1999, as cited in de Valois et al., 2012, p. 302). The treatment should address quality of life, physiological and psychosocial problems associated with lymphedema. Complementary and Alternative Medicine (CAM) is increasingly desired by cancer patients (de Valois et al., 2012). Acupuncture, part of Traditional Chinese Medicine, is a CAM modality cancer patients are drawn to for improvement of symptoms and better physiological and psychosocial coping (de Valois et al., 2012). Can acu/moxa improve wellbeing in cancer survivors with lymphoedema? What symptoms are most troublesome for these individuals? Is acupuncture a safe intervention for people with lymphoedema? Medical Outcome Profile (MYMOP) “…is widely used for evaluating interventions based on holistic and participative principles, and allows patients to define and evaluate outcomes that are pertinent to them” (de Valois et al., 2012, p. 303). The Medical Outcomes Study Short Form (SF-36) “…is a generic 36- item functional status questionnaire that assesses eight domains of physical and psychological health” (de Valois et al., 2012, p. 303). The Positive and Negative Affect Schedule (PANAS) “…is a 20-item validated measure used to assess mood states” (de Valois et al., 2012, p. 303). The acupuncture protocol was designed to replicate “usual clinical practice,” (de Valois et al., 2012, p. 303) with treatments focusing on “presenting signs, symptoms and priorities” (de Valois et al., 2012, p. 303) of the patients, as this “real-world” acupuncture study design has high external validity. de Valois et al. (2012) mention in their paper that, for further studies, they will eliminate the PANAS questionnaire due to higher than expected proportion of missing data. The authors also make a note of some limitations of their study, which are: uncontrolled study design, single setting, small number of head & neck cancer patients participants, and research acupuncturist acted as principal investigator as well (de Valois et al., 2012). The authors also point out that they never set out to cure lymphedema, rather they wanted to show that patients with lymphedema can use acupuncture safely to address “…a range of physical and emotional conditions, and reduce symptom burden (de Valois et al., 2012, p. 307). Because of the significant improvements (as mentioned in the abstract) further research is warranted to investigate the effects of acupuncture in lymphedema. The authors have plans for a randomized controlled trial investigating the effects of acupuncture in breast cancer related lymphedema. What do the study results mean for a cancer patient wanting to use acupuncture addressing lymphedema? This trial can not be generalized, due to some of the limitations mentioned above. It was simply not designed to this. It was designed as a pilot trial to determine if further research might be warranted. That does not mean you should not discuss this option with your primary health care provider. She/he might be open to working with an expert acupuncturist to see if acupuncture could be a viable treatment, to address the physical and emotional conditions and to reduce the symptom burden you might be experiencing, especially if lymphedema is the result of breast cancer treatment. Ganz, P.A. (1999). The quality of life after breast cancer – solving the problem of lymphedema. New England Journal of Medicine 340 (5), 383-385. 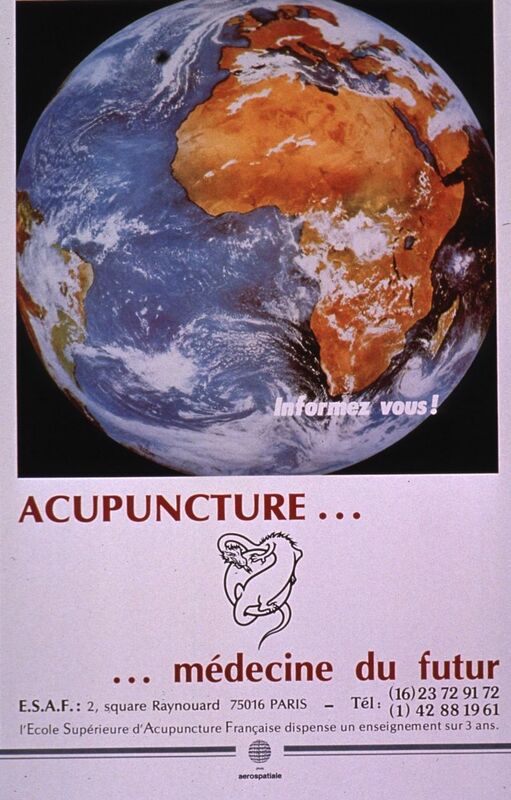 École supérieur d’acupuncture française. (n.d.). Images from the History of Medicine (NLM): Acupuncture. Retrieved from Images from the History of Medicine (NLM) website at http://ihm.nlm.nih.gov/luna/servlet/view/all. MLA: Absenger, Werner. 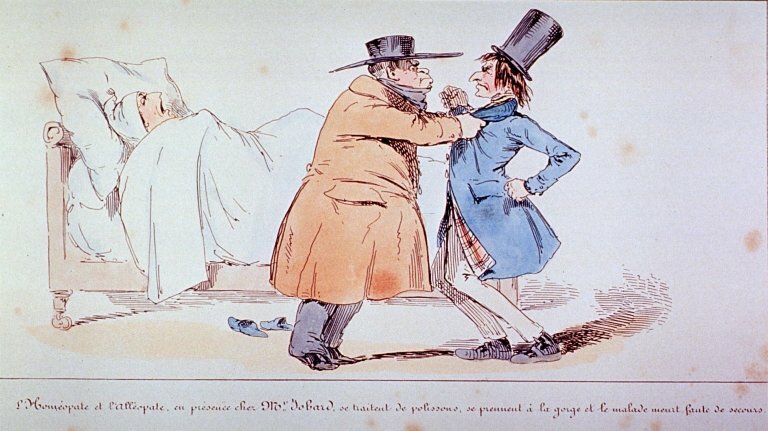 “de Valois et al. (2012). Assessing the Feasibility of Using Acupuncture and Moxibustion to Improve Quality of Life for Cancer Survivors with Upper Body Lymphoedema.” The Alternative Medicine Blog. The Alternative Medicine Blog. 23 June. 2012. Web. Insert your date of access here. This team of researchers looked at the effects of potentized cholesterinum used with another homeopathic remedy, Natrum Sulphuricum on carcinogen-induced hepatotoxicity. In other words, the researchers wanted to see if these two homeopathic remedies could reduce damage of cancer causing agents fed to mice. The purpose of the study was to evaluate whether potentized cholesterinum (Chol) intermittently used with another homeopathic remedy, Natrum Sulphuricum (Nat Sulph) can provide additional benefits in combating hepatotoxicity generated by chronic feeding of carcinogens, p-dimethylaminoazobenzene (p-DAB), and phenobarbital (PB). Mice were categorized into subgroups: normal untreated (Gr-1); normal + alcohol “vehicle” (Alc) (Gr-2), 0.06% p-DAB + 0.05% PB (Gr-3), p-DAB + PB + Alc (Gr-4), p-DAB + PB + Nat Sulph-30 (Gr-5), p-DAB + PB + Chol-200 (Gr-6), p-DAB + PB + Nat Sulph-30 + Chol-200 (Gr-7), p-DAB + PB + Nat Sulph-200 (Gr-8), and DAB + PB + Nat Sulph-200 + Chol-200 (Gr-9). Hepatotoxicity was assessed through biomarkers like aspartate and alanine aminotransferases (AST and ALT), acid and alkaline phosphatases (AcP and AlkP), reduced glutathione content (GSH), glucose 6-phosphate dehydrogenase (G6PD), gamma glutamyl transferase (GGT), lactate dehydrogenase (LDH), and analysis of lipid peroxidation (LPO) at 30, 60, 90, and 120 days and antioxidant biomarkers like superoxide dismutase (SOD), catalase (CAT), and glutathione reductase (GR) were assayed. Electron microscopic studies (scanning and transmission) and gelatin zymography for matrix metalloproteinases were conducted in liver. The feeding of the homeopathic drugs showed intervention in regard to the increased activities of AST, ALT, AcP, AlkP, GGT, LDH, and LPO and decreased activities of G6PD, SOD, CAT, GR, and GSH noted in the intoxicated mice, more appreciable in Groups 7 and 9. Thus, combined therapy provided additional antihepatotoxic and anticancer effects (Bhattacharjee & Khuda-Bukhsh, 2012, p. 1). If you are unfamiliar with homeopathy, here is a little more information to become familiarized with the principles of homeopathy. The Western medical tradition generally frowns up homeopathy. That is because remedies are usually diluted to the point at which one could say that too few molecules remain of the original substance in the heavily diluted remedy. In other words, the remedy has been subjected to trituration, dynamization and succession, sometimes beyond Avogadro’s limit (Bhattacharjee & Khuda-Bukhsh, 2012), thus causing great controversy among scientist. The authors of this paper talk about Natrum Sulphuricum (Nat Sulph) -30 and 200 and cholesterinum (Chol) -200. “Supposing 40g of calcium (one mole) were diluted by homeopathic principles starting from 100% pure substance. Avogadro’s number tells us that we have 6.02×1023 molecules per mole. By 7C the remedy would be expected to contain about 6 billion calcium molecules, and by about 11C, it would be expected to have only about 60 ((1/100)11 x 6.02×1023 = 60.2). At the 12C (or 24X) dilution, there is a 50/50 chance of one molecule being present. The dilution at which one would expect to have only one molecule does depend upon the starting number of molecules, but assuming that we started with all the atoms estimated to be in the universe, about 6×1079 then we end up with a 50% chance to have one molecule left at 40C (or 80X), still far more concentrated than the 200C dilutions that are commonly dispensed (Creighton University School of Medicine, n.d.). To add to the dilemma of understanding and providing evidence for homeopathic remedies is the clinical trials are plagued with problems. Pitari (2007) points out that, amongst others, homeopathic research requires more rigorous trials and more specific trail methodology. 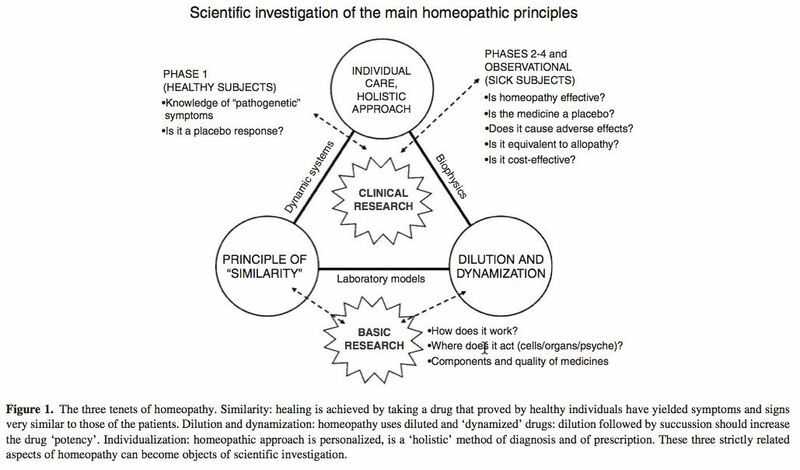 The author presents and illustration in her paper on how to more effectively design research in homeopathic medicine in order to provide credible evidence either for or against efficacy. Having show that homeopathy is not without controversy, lets look at the results from Bhattacharjee & Khuda-Bukhsh (2012). Because this research was performed on mice, it was possible to tightly control the experiment’s condition. In the result section Bhattacharjee & Khuda-Bukhsh (2012) report that on autopsy groups 1 and 2 showed healthy liver, while all the other animals showed tumor growth who received the carcinogens for 60 days or more. As compared to all carcinogen fed mice showing distinct sign of tumor formation in the form of pale reddish multiple nodules, the incidence and intensity of tumor was found to be greater in the carcinogen fed mice (more pronounced in the p-DAB+PB and p-DAB+PB+Alc fed series) at 60, 90, and 120 days, the incidence and growth of tumors found in the drug fed series was less, both numerically and qualitatively. Further, in the conjoint drug fed series, the number of tumors was also lesser than in the single drug fed series (Bhattacharjee & Khuda-Bukhsh, 2012, p.5). Differences were statistically significant and Nat Sulph-30 plus Chol-200 fed mice positive activities were most pronounced at the 90 day and the 120 intervals, with Nat Sulph-200 alone showing considerable ameliorative effect, while a combination of Nat Sulph-200 and Chol-200 showed the greatest effects (Bhattacharjee & Khuda-Bukhsh, 2012, p. 5). …Potentized homeopathic drugs might have the ability to act as a ‘molecular trigger’ for switching ‘on and ‘off’ certain relevant gene action/interaction, a series of biochemical changes could follow, that in turn could bring about the alteration observed in the parameters of the present study (Bhattacharjee & Khuda-Bukhsh, 2012, p. 9). Furthermore the authors point towards nanoparticle research that demonstrated alteration of the “…physico-chemical property of the drug and its biological action during the process of homeopathic dynamization” (Bhattacharjee & Khuda-Bukhsh, 2012, p. 9). Based on this research one could speculate that both homeopathic remedies could be used to treat human liver disorders associated with cancerous lesions (Bhattacharjee & Khuda-Bukhsh, 2012, p. 9). But there is one caveat of course, more studies should be performed by other researchers to either confirm or refute these most peculiar findings. Why peculiar? Remember, based on the tenets of classical physics, chemistry and other know facts about the universe these results should have NOT manifested in the first place. MLA: Absenger, Werner. “Bhattacharjee & Khuda-Bukhsh. (2012). Two homeopathic remedies provide protective effects against hepatotoxicity induced by carcinogens ” The Alternative Medicine Blog. The Alternative Medicine Blog. 21 June. 2012. Web. Insert your date of access here.